Scripted Review – Is This Content Site Worth Your Time? Published July 16, 2012 By Anna T. This post may contain affiliate links. Regardless, I only recommend sites I've researched and/or used and trust. Scripted is a newer writing site that just appeared on my radar recently. Many freelancers are currently using them for additional writing income. In this Scripted review, I'm going to share with you how it works, what they pay, how to apply, and reviews from others who have used the site for writing income. When you write for Scripted, you are a ghostwriter for their clients who need fresh content. This means your name isn't published on what you create, and all rights to the content are transferred to the client upon article acceptance. Scripted considers writers in the US and 18 other countries, including Australia, Canada, Denmark, Finland, Ireland, Norway, Sweden, UK, Austria, Belgium, France, Germany, Italy, Japan, Luxembourg, Netherlands, and Spain. The amount you earn varies depending on the type of content, article length, and topic. However, some assignments may pay upwards of $20 a piece. Scripted states that you can expect payment for the content you create five days automatically after your work gets accepted by the client. If you are asked to do edits, Scripted promises to pay within two days after the edits are completed and approved. If their clients rejects your edits, you will still be paid 50 percent so your work won't have been for nothing. 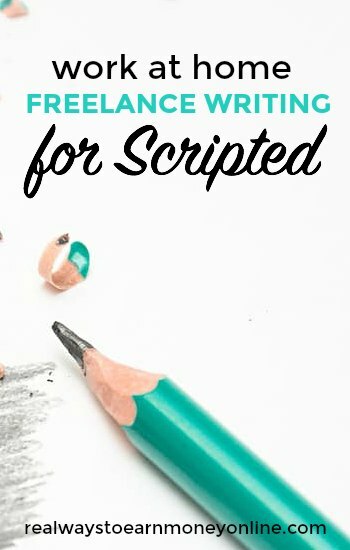 To begin writing for Scripted, you have to fill out the writer registration form and also submit a writing sample (one that has never been previously published). When you apply, you must select different industries you feel you are qualified to write in and a sample reflecting your ability to write within each industry you select. So if you select three different industries, you must submit three different samples for each one. The current industries you can choose from are art and design, business and finance, internet and software, environmental, government and politics, law and legal, lifestyle and travel, media and entertainment, and sports and fitness. You may only apply to each specialty once. If you get rejected for an industry, you can't ever attempt to apply to it again. After you've been approved, you'll see that you have an assigned writer score. This is based on the quality of the sample(s) you submitted at sign up. The higher the score, the better because sometimes writers with high scores get a chance to claim jobs before writers with lower scores do. Also, you might get more email invites if your score is high. Once your application is approved, you may begin claiming jobs. Scripted might also email you with open jobs. Clients can additionally “favorite” you if they really like your writing. This gives you first dibs on assignments from those clients. While searching for a Scripted review online, I found a mix of feedback. Some writers complain that they can't ever seem to grab any jobs while others really enjoy writing for the company. WAH Adventures review of Scripted – Definitely check out the comments on this one. If you want to begin the application process, you can go here. This is the most profitable route to take as a freelance writer. You can get your own clients and set your own rates, which you cannot really do with Scripted or other content sites. A six-figure income is not outside the realm of possibility when you're running your own business. I believe something must have changed at Scripted. They stiffed me on pay, citing a “client error.” When you’re a middleman, which Scripted is, you eat the cost of client errors… you don’t decide not to pay your writers. They not only didn’t pay the price as agreed but they also took ownership of the pieces. It happened to another writer, too, at exactly the same time. My scam radar is going off bigtime. It’s a shame; Scripted.com was one of the last few “reputable” content mills. Oh well. I’d advise companies to just hire private writers; they’ll save money and will get better service anyway. I am on Scripted’s roster. I do like everything about how they manage themselves and me. My only issue is with the clients, who seem to drag their feet when it comes to pitches, edits, etc. Some do act fast, and some even tip a little bit, but I have a massive backlog of pitches. So far, I’d say to apply, but don’t expect much work from them. I may get a nice dinner out from my pay there this month, but not much more. Oh, their method of payment is quite good and so far everything is paid in a timely manner – once the client does their part, that is. I first applied to Scripted in 2012 and got turned down for a specialty within one day. I recently re-applied and got accepted to a separate specialty within hours, another is now pending. What I find a bit squirrely is that I could not find on their website when they pay. It just makes reference to the end of the month. I read with interest on here that they use bill.com as I am sure they told me paypal. I haven’t accepted any work for them for the one specialty I got accepted to, primarily because there isn’t any! Wow, the exact same thing happened to me. Word for word, on two different subject applications. Spooky. It’s like they don’t want to admit that they aren’t hiring. Regarding the consistency of your voice: I know what voice this piece needed, but the writer didn’t execute it perfectly. Regarding the clarity of your writing: I see what the writer was trying to express, but I’m still a little confused. Regarding the flow of your prose: The thoughts linked together, with one or two notable exceptions. Regarding the extent to which you kept the reader engaged: The subject was interesting and informative, but my focus still wandered. Unfortunately, we’re not able to reverse this decision. However, you are welcome to apply to other specialties on Scripted. Simply reply to this email if you have any questions! Now, how exactly do two applications, which deal with entirely different subject matters receive the exact same responses?? I got the message, in all probability my applications were not even read, these are blanket rejections, there were no details on what exactly was wrong. To sum it up, don’t waste your time with those clowns. Just to play devils advocate, is it possible they are using sample writings without having to pay for them? It is unethical, but it happens often in the writing world………you might want to check if any of your writing was published. I applied for a specialty and Scripted two months ago, lured by the promise of fairly high pay. After twisting in the wind for all that time, I broke down and complained. Their response? A quick rejection. Their comments were, and I quote: “I see what the writer was trying to express, but I’m still a little confused.” “The thoughts linked together, with one or two notable exceptions.” and “The subject was interesting and informative, but my focus still wandered.”. This was, for the record, an essay on Hegel for the Religion and Philosophy specialty. Apparently, the editors are not only vindictive, but also don’t understand their topics. A wretched experience overall.